The solemnity of the Annunciation is also known in some places as Lady Day. 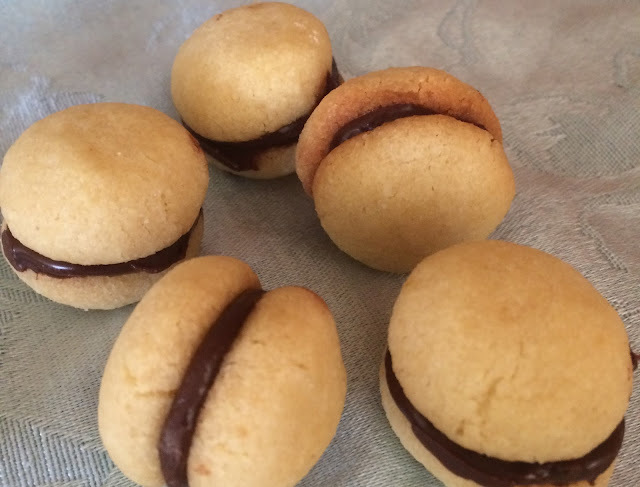 When I first saw these little bite-sized Italian cookies called, baci di dama or "lady’s kisses", I thought of them as an option for this day - Lady Day. I can imagine them being Our Lady's kisses - kisses Our Lady would have bestowed on her sweet son. The name originates from the cookie’s resemblance to two lips holding together like a kiss. These Italian cookies are common for feast days in Italy - especially St. Joseph. Most years St. Joseph's feast day and the Annunciation are a week apart, so making double at that time could cover both feasts. Though this year the feast is abrogated to April 9 because its traditional date fell on Palm Sunday. The outer cookies are delicate and usually made of almond or hazelnut flour. The hazelnut version is from the city of Cuneo (where Nutella comes from), and the almond ones are from the town of Tortona. There are some different variations of the recipe available. This is adapted from the Martha Stewart recipe. Preheat oven to 325 degrees. Beat 7 tablespoons butter with sugar on medium-high speed until light and fluffy, about 3 minutes. Add vanilla and lemon zest, then both flours and salt; beat until a dough starts to form. Transfer to a work surface; knead until a firm dough forms, 1 minute. Scoop 1 level teaspoon of dough; roll into a ball. Place on a rimmed baking sheet lined with parchment. Repeat with remaining dough, spacing balls 1 inch apart. Place in freezer about 15 minutes, until firm. Melt chocolate and remaining 1 tablespoon butter. Let cool until thick and spreadable. Bake cookies until domed and light golden, about 16 minutes. Let cool completely. Spread 1/2 teaspoon chocolate mixture on flat side of one cookie; sandwich with flat side of a second. Repeat with remaining cookies. Let chocolate set before serving. I found this litany poem by G.K. Chesterton which speaks of a kiss and the mystic rose – a reference to Mary (as are all the symbols in this poem). So beautiful and definitely brings to mind the image I was imagining between Mother and the Child Jesus. Peered through you, gate of heaven—and saw the earth. Return upon him as a tale is told. God looked on God, as ghosts meet in the night. And heaven looked upwards in a human face. Made of his throne indeed a mercy-seat. And kissed upon your mouth the mystic rose. Note: I also think these little cookies would be fitting for the feast of St. Mary Magdalene (July 22) as she is believed to be the woman who washed with her tears, anointed with oil and kissed the feet of Christ. She is often depicted kissing Christ's feet. Lady Kisses could represent her as well. These look delicious! Must make!